Trisha can be seen embracing her dad in this photo from her childhood. 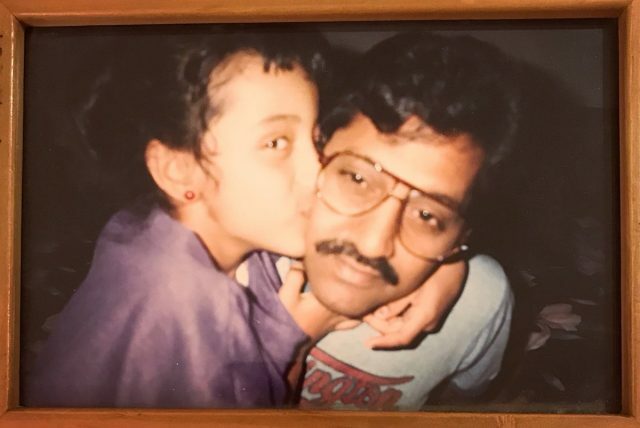 The lovely Trisha—who is one of the most sought-after names in Tamil cinema—recently took to Twitter and shared a heart-warming throwback photo from her childhood with her fans. In it, she can be seen with giving her dad a warm kiss and an affectionate embrace. Now isn’t that a cute sight. We are sure that this photo will create quite a buzz amongst movie buffs. In case you did not know, Trisha was born in Chennai and did her early schooling there itself. After trying her at hand at modelling, the diva began her tryst with the big screen when ‘Mounam Pesiyadhe’ hit screens in 2002 and became an above average grosser. She has been a part of several memorable films since. At present, she has a host of films in her kitty. They include ‘Hey Jude’, ‘Garjanai’ and ‘96’. While Garjanai is a thriller, Hey Jude is a romantic-comedy and will mark her Mollywood entry. As far as ‘96’ is concerned, it is a romantic-drama and also features Vijay Sethupathi in the lead. Sometime ago, she had said that the film is a bit similar to ‘VTV’. “The movie is a beautiful romantic journey and one has to watch it to feel the soul of it. I can’t describe the emotion in words. It’s like another Vinnai Thaandi Varuvaaya for me! I have been in discussion with Prem Kumar almost a year now,” she had added. So, did you like this photo of Trisha with her dad? Tell us in the space below.